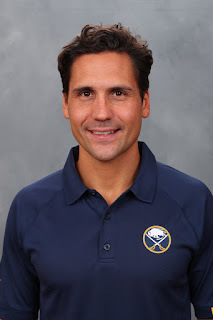 AMHERST, N.Y. -- Daemen College's 2018-19 Nancy Haberman Gacioch Entrepreneurship Lecture Series will open on Oct. 24 with featured speaker Dr. Ed Gannon, head of strength and conditioning for the Buffalo Sabres and the Rochester Americans. The lecture will be held at 5:30 p.m. in Daemen's Wick Campus Center Alumni Lounge. It is free and open to the public. Gannon, who has been working as a strength and conditioning coach in professional sports for 14 years, will discuss athletic training in professional sports, drawing from both U.S. models and international models for sports such as rugby and European football. During Gannon's tenure working with three professional rugby union teams in the United Kingdom, the teams won the European Rugby Champions Cup, three English Premiership Championships, and two English League Cup titles. Gannon has lectured for post-graduate sport science and medicine programs throughout the U.S. and U.K. on the science behind strength and conditioning. He earned a doctorate in applied strength and conditioning from the University of Bath.